Hello, and welcome to my site! I'm Kari! This site is all about the wonderful anime/manga series, Cardcaptor Sakura! Please don't take anything from my site with out asking, thanks! Hey, feel free to e-mail me any time, with a question or just a comment! I always like to hear from you! ^_^ Now why don't u take a look around? May 16/05- Yay, I have a new affy! Go check out Sakura Network. May 09/05- I updated Cardcaptor Sakura Blooming Day's link. It's super cute, be sure to check it out! 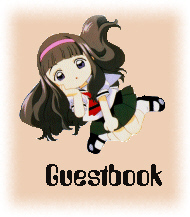 My guestbook seems kind of...defunct. *sigh* I'll try working on that. Jan.27/05- I changed around some pages, like the summary page. I added the prologue to a fan fic and organized all the fan fics into one section...though I have yet to make a button for them. I've become obsessed with fan fiction in the last few months, so I'm going to start writing fics. To check out some of my fics go to: http://www.fanfiction.net/u/574914/ . As you can tell, I finally updated the layout. I'm going through a black/pink phase, but it didn't turn out the way I wanted. Mostly because I'm having trouble with my new image-editing program (I miss my old one! ;_;). Jan.23/05- I'm alive! Really, I am. Between exams, computer problems of all kinds, and overall lack of time I haven't been able to update in a very long while. I apologize to my affiliates whose links I was not able to add/update until now. I'm working on a new layout and I'll probably re-write a lot of stuff, so once I learn how to use my new image program anf finish, I will update again (whic may take a while). Bare with me, everyone! Jun.17/04- The summer is finally here, yay! My affy, S+S Shrine is having a contest, so be sure to check it out. I do not own Cardcaptor Sakura! I don't own any of the images on this site, they're all property of CLAMP, Tokyopop, Kodansha and all of the other companies.